Go to an island which have a very nice beach and blue ocean. e.g: Pulau Tioman, Pangkor, Pulau Kapas, any pulau la.. Spend my whole day on the beach, picnic, see the sunset, collect sea shell, write my name on the sand, feel the ocean breeze on my face and stay i a wooden chalet.. 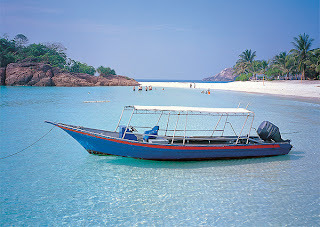 I just want to have a vacation at Pulau!!!! Really really want to!!! I don't care if i have to go alone. Seems like nobody care pun..I don't mind.. i can go anywhere i like by my own..i can take care of myself.. I wish i can feel like "i just don't care"
Oh, maybe i can bring my family along..Mak sure happy to go..i can bring Mak, abah n nuru..We will have a very good time.. dah lame x gi jalan2.. and dah lame rase nak gi pulau..but i don't know when i can go. I wish i can go today.. waaa!!! linda la nih, cakap nak gi Tioman.. kan aku dah rase nk gi pulau.. it's ok, mak, nnt Kak Yong bawak mak gi pulau ye..